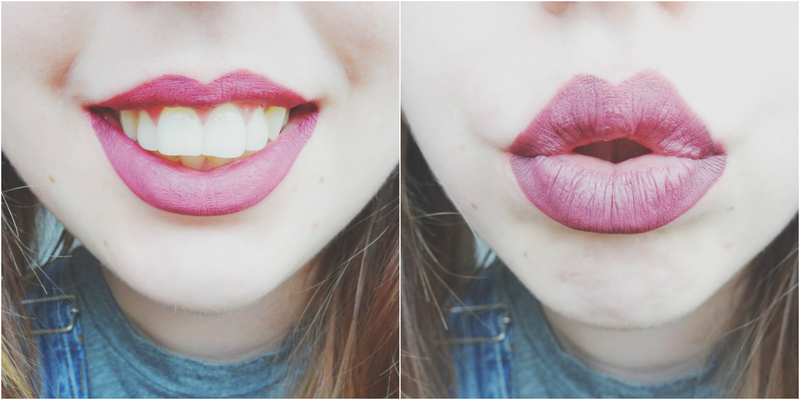 Today I bring you a review of Sleek's Matte Me liquid lipsticks. I have fallen in love with this range and am pretty darn excited to now own three of the shades. This is the darkest shade I own, it's a deep berry colour and perfect for autumn/winter. Can't wait to use this over the festive period. I find this shade pretty easy to apply, as the applicator allows for a fair degree of precision. Since it's such a dark shade, though, a lip liner would be best if you were wearing this for going out somewhere. I didn't have to top up the applicator at all, it covered my lips in an opaque shade no problem at all. I didn't think it was patchy at all and didn't show off the fact that my lips were a little bit dry. Damn, you changing weather! I haven't worn this shade out yet, but I did eat my lunch with it on and drink a lot of apple juice to put it through its paces. It came off a little bit as I was eating, but not anything a quick top up couldn't fix. The only thing I would say about this liquid lipstick is that when it does rub off, it's fairly unforgiving, for me personally, as the contrast between my natural lip colour and this dark velvety shade is so different. This will not be stopping me wearing it, though! I should also point out that when I wanted to take it off, it did not budge. It looks a lot of makeup wipe to get this to come off. This is probably the most wearable shade for me. It's a dark brown/purple colour, depending on whether you are in natural or artificial light. Once again, this was easy to apply and I only needed one application to cover my lips. I really like this shade because although it's a bit darker than my natural lips, it's not that far off, that when it does start to rub off it's not blindly obvious to everyone else. I've got through a night of Mexican and pubbing it up only have to apply this once. Yes, I used straws all night, but it was still on my face at the end of the night. This is my fave out of the three. Petal, petal, petal. Oh, how I wanted to love you. When I was perusing around Boots a month or so ago, toying with which shade to buy first, I remember swatching Petal on my hand. At first, I wasn't impressed, and I fell in love with Shabby Chic. However, as the day went on, I don't know whether it was just because it had fully dried, or what, but I immediately regretted not buying it. So a couple of weeks back, I caved and bought it. Why did I do this? The first time I wore this, I knew it was a mistake. I don't know what it is about this shade, but it's just not cool. It looks like it's going to be quite a dusty shade of pale pink. Not too in your face, nothing cray cray, just an everyday pretty little colour. Nope! Upon application, Petal comes out in a bright, almost verging towards baby pink shade in some light. This is not what I wanted. Also, I don't know whether this formula is slightly different, but it just seems to come out very patchy, shows up any dry flecks on my lips, and well, it just doesn't float my boat. It doesn't fit with how much I love the other two. Another point I must make, this shade has a different applicator. Is this the case for all bottle of Petal? Should they all be this shape, or have I just picked up a dodgy one? The applicator wasn't bad by any means, but it just made the application a little less precise than the others. All in all, I'm pretty happy to like 2 out of the 3 shades I've purchased. What I love about these liquid lipsticks from Sleek is how affordable they are. Only £4.99 makes it very easy to purchase more. I will be keeping an eye out for any new shades, for sure. If you own some of the range, please enlighten me on the whole applicator mystery. I'm curious whether it's just a lucky dip on which one you get, whether it just depends on how old the stock is, or maybe there's some secret behind it all. Who knows. Thank you for reading my post! I hope you enjoyed it as much as I did writing it!